The Rabbit is a rabbit from Donkey Kong 64 that lives in the carrot-shaped house in Fungi Forest. He apparently heard from somewhere that Lanky Kong is very fast, so he challenges Lanky with a Golden Banana as the prize. In the first race, when Lanky wins, the Rabbit refuses to give him the banana. Instead, he tells Lanky to come back and to accept the "consolation prize," which is three blue Banana Coins. 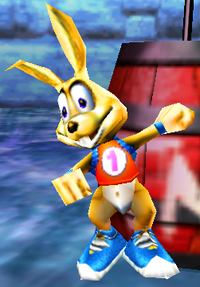 In the second race, the Rabbit is much faster where the OrangStand Sprint ability from Cranky Kong is required to beat him and earn the Golden Banana. In Crystal Caves, Chunky Kong finds the Rabbit tied to a TNT Barrel in an igloo. After Chunky saves the Rabbit from the Flames, he is rewarded with a Golden Banana. ↑ Donkey Kong 64 Banana Guide on Nintendo.com, Nintendo. Retrieved November 26, 2014. This page was last edited on April 13, 2019, at 21:58.